LBS Bina Group Bhd’s long wait of more than 10 years to monetise and redevelop its assets in Zhuhai City, Guangdong Province, China, may end soon. Its managing director Tan Sri Lim Hock San expects the approval for the conceptual design to come from the local governments in the next 12 months. He tells The Edge that there will be 14 projects on the Zhuhai International Circuit (ZIC) land, including hotels, factory outlets, a theme park, residences and a Malaysia cultural centre, besides the car racing circuit itself. “We are targeting for the conceptual design of the project to be approved by the local government in the next 12 months. With the project getting the nod from the provincial government, the local government will speed up the approval process,” says Lim. To recap, LBS Bina (fundamental: 1.00; valuation: 2.40) signed a memorandum of understanding (MoU) with Zhuhai Jiuzhou Holdings Group Co Ltd on Sept 19 for the proposed upgrading of ZIC. LBS Bina has a 60% stake in ZIC project through its wholly owned subsidiary Lamdeal Investment Ltd. Under the MoU, the upgrading plan is outlined by four concepts. The project will integrate motorsport into a modern urban lifestyle as well as have a comprehensive service centre, special attractions for cultural exchanges, a Melaka cultural museum and a Made in Malaysia Excellence exhibition hall. The signing of the MoU was witnessed by Melaka head of state Tun Mohd Khalil Yaakob, Melaka Chief Minister Datuk Seri Idris Haron and Guangdong Province Governor Zhu Xiaodan. The presence of both Melaka’s head of state and Guangdong’s governor shows that the relationship between Malaysia and China is much stronger, says Lim. Zhu and Idris agreed to enhance friendly and cooperative relations between the south-eastern province of China and Melaka. “This cooperation is part of China’s One Belt, One Road policy, and we are happy to be a part of it,” says Lim. The redevelopment of ZIC has always been on the cards for LBS Bina, ever since it was listed on Bursa Malaysia through a reverse takeover of Instangreen Corp Bhd in 2002. There were three assets in Zhuhai City, including ZIC, that LBS Bina inherited from Instangreen. The other two were a 328-acre golf course and a 197-acre development land, both of which have been sold to Zhuhai Holdings Investment Group Ltd for HK$1.65 billion — to be settled with HK$1.35 billion cash and 225.5 million shares or a 16% stake in Zhuhai Holdings. The cash payments were divided into four tranches between 2014 and 2017. So far, LBS has received HK$950 million in cash payments. LBS Bina has utilised part of the cash to pare down its borrowings, reducing its gearing to 21% currently from 68% in the financial year ended Dec 31, 2012 (FY2012). Its gearing is expected to drop further to 5.4% in FY2015, says JF Apex Securities Bhd analyst Lee Chung Cheng, who covers the company. He estimates LBS Bina’s stake in ZIC to be worth RM690 million. The company’s market capitalisation stands at RM838 million, based on the stock’s closing price of RM1.54 last Friday. Its share price has increased 19.5% since Sept 1. Lee pegs LBS Bina’s target price at RM1.70, implying an 11.6 times FY2016 forecast earnings per share. LBS Bina announced the receipt of the second tranche of HK$800 million in cash from Zhuhai Holdings on Sept 1, four months earlier than the agreed date of Dec 31 as per the disposal deal. The developer has allocated HK$80 million for dividends. This would translate into dividends of about 8.3 sen per share. 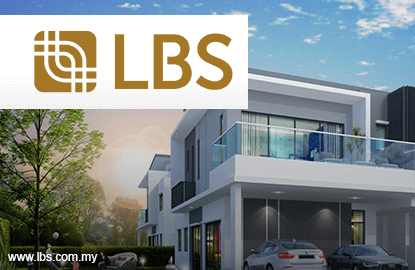 However, the signing of the MoU did not bring much excitement to LBS Bina’s share price, which could be partly due to the fact that all the parties have yet to sign a firm development agreement. Furthermore, China’s economy has been on a slower trajectory since the first quarter of last year. The world’s second biggest economy expanded 7% year on year in the second quarter of this year, the same rate seen in the first quarter, which was the slowest since 2009. China’s property market has also experienced a slowdown. Growth in real estate investment in the country continued to slow in the first eight months of the year to 3.5% y-o-y, compared with 10.4% in January, according to the National Bureau of Statistics of China. This raises the question of the timing of the project. “Yes, China’s economy is slowing down. However, tourism is big in China. The project will have many tourist attractions such as a theme park and a Malaysia-China cultural centre,” Lim says, adding that the development will be undertaken in partnership with other parties. The racing circuit is currently being used by racing clubs from Hong Kong and Macau, and as a test ground for car manufacturers. It incurred a net loss of RM5.53 million in the first half of FY2014 with revenue of RM10.5 million. Nonetheless, Zhuhai’s economy may get a boost next year as the Hong Kong-Zhuhai-Macau Bridge will be completed then. Construction of the 50km link started in 2011, with an estimated cost of US$10.6 billion. The combined population of the special administrative regions and Zhuhai is about nine million.